The Science of Bicycles and the Joy of RAGBRAI! This year the Register’s Annual Great Bike Ride Across Iowa (RAGBRAI) will stop in Coralville on July 24. RAGBRAI XLIII began in Sioux City on July 19 and will finish in Davenport on July 25. There are 6 overnight stops along the RAGBRAI route and the longest day of riding is the first day – from Sioux City to Storm Lake, a distance of just over 74 miles. The first RAGBRI was held in 1973, and started as a challenge between the Des Moines Register feature writer/copy editor John Karras and Donald Kaul, author of the Des Moines Register’s “Over the Coffee” column. The ride was opened to a “few friends,” i.e. the public. Fortunately, the turnout was light, because no camping arrangements – or any other types of arrangements – had been made for the riders. The number of riders varied along the route, but 114 riders made the entire distance that first year. One of the interesting people the ride attracted was Clarence Pickard of Indianola. The 83-year-old showed up for that first ride with a used ladies Schwinn. He rode all the way to Davenport, including the 110-mile trek from Des Moines to Williamsburg on a 100°+ day. For the ride he wore a long-sleeved shirt, trousers, woolen long underwear and a silver pith helmet. Because there so much national and international media coverage, the number of riders increased quickly. In order to make the ride more manageable, it is now limited to 8,500 registered riders each year. Since RAGBRAI began 326,650 riders have pedaled over 19,000 miles. 780 towns have been visited since its inception. Whether you want to hit the road on RAGBRAI, or simply want to cruise around town for transportation and exercise, the type of bike you purchase makes a difference. Where you plan to ride, with whom will you be riding, your budget, and your previous experience all make a difference when choosing a bike. Mountain bikes are great for off-road and single track trails, but they are heavier, have thicker tires and are generally slower and require more effort. Road bikes are for paved roads, paths and smooth unpaved paths. They are lighter and designed more for speed. There are also hybrid and comfort bikes, tandems, recumbents, commuters and cruisers. If you have questions about specific bikes, RAGBRAI has a forum where information is available from experienced riders. The bicycle is a simple machine, but has many components and it is always a good idea to learn what each component is called. There are 10 bicycle shops that now participate in RAGBRAI, but it doesn’t hurt to know basic maintenance for your own equipment. Learning to repair tire punctures yourself can keep you from being stranded by the side of the road whenever and wherever you ride. Bike Repair & Maintenance for Dummies has a section on what to look for in a pre-ride inspection, how to clean and take care of your bike after your ride, and items that should be included in an emergency tool kit – including duct tape! Interested in building your own custom bike? Bike, scooter, and chopper projects for the evil genius has the information you need to create your own Gladiator Chopper, 3-wheel trikes for adults and kids, stunt bikes, and electric-powered bikes! Electric bikes, or e-bikes, are becoming more popular. 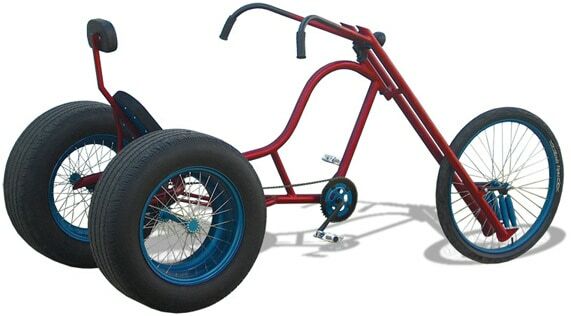 A modified or custom bike frame that has pedals but also and electric motor gives the rider the option to pedal or use the power of a battery and motor drive system. They are less expensive than gas-powered scooters and are safer than scooters and motorcycles. A 1 square foot solar panel is enough to power an eBike for 3,100 miles. 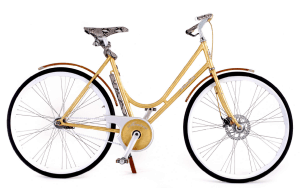 There are also luxury bikes – the Monanate Luxury Gold bike has 24 carat gold leaf and 11,000 Swarovski crystals. The fenders are steam-bent wood and there is python leather on the handlebars, seat and around the lock. There are only 10 Luxury Gold bikes in existence and cost about $33,000. 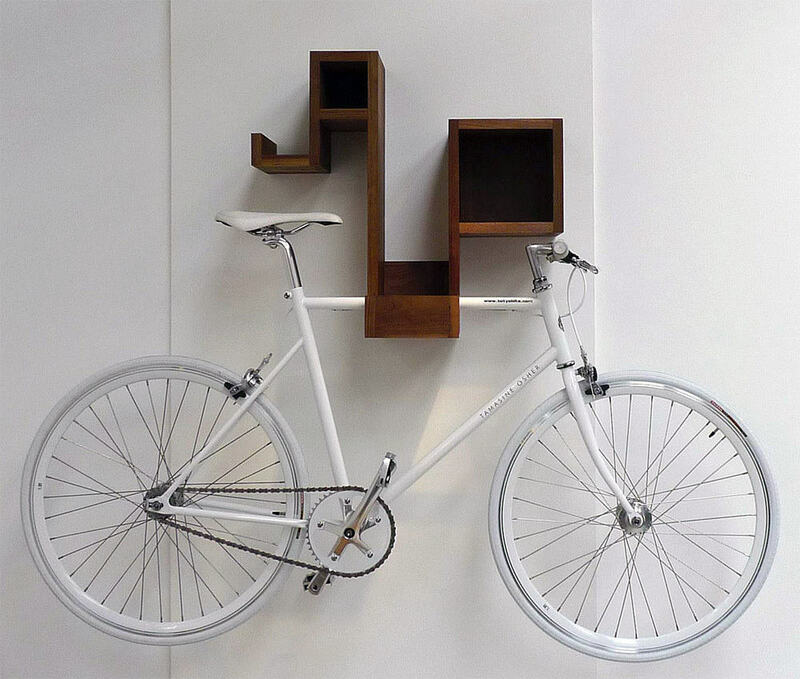 There are many beautiful and practical ways to store your bicycle, too. The Pedal Pod by British Designer Tamasine Osher, is sold walnut and is the perfect place to store your bike and accessories. Stop by all the Coralville RAGBRAI activities on Friday and if you find yourself intrigued by the world of cycling we have resources on everything from Effective cycling, The bicycle builder’s handbook, to Bicycling science: ergonomics and mechanics. Let’s Ride. 2015. City Bikes. Drinkell, Peter. 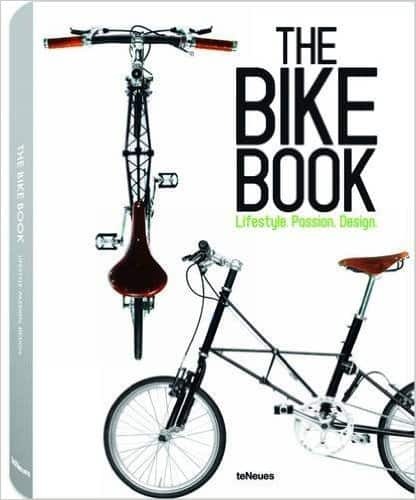 The bike owner’s handbook. 2012. London : Cicada Books. Engineering Library TL430 .D75 2012. What is an electric bike? 2015. Electric Bike Review. Graham, Brad. 2008. Bike, scooter, and chopper gadgets for the evil genius. New York : McGraw-Hill. Engineering Library TL400 .G689 2008. The bike book : lifestyle, passion, design. 2012. Kempen, Germany : teNeues. Engineering Library FOLIO TL410 .B54 2012. Forester, John. 2012. Effective Cycling. Cambridge, Mass. : MIT Press. Engineering Library GV1041 .F67 2012. Do You Remember the Typewriter? New Exhibit Explores the History! 25th Anniversary of the Americans with Disabilities Act!